Fiction – paperback; Tin House Books; 459 pages; 2014. 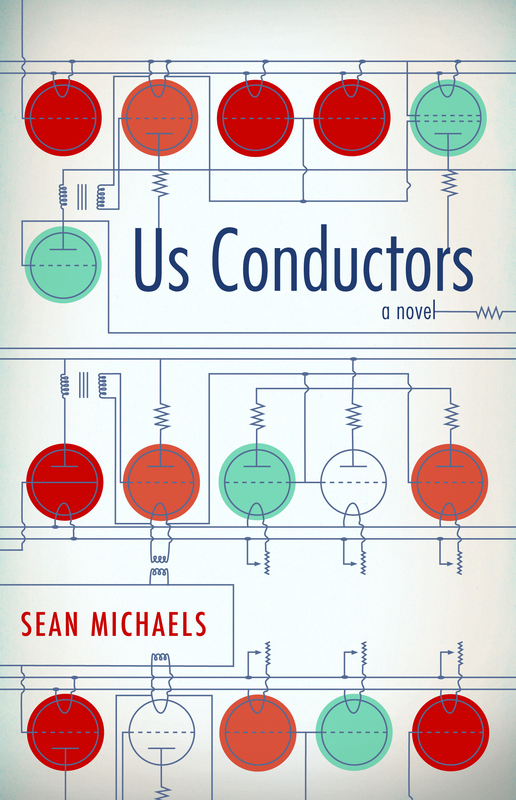 Sean Michaels’ debut novel, Us Conductors, is a fictionalised account of the life of Russian engineer and physicist Lev Sergeyevich Termen (1896-1993) — later known as Leon Theremin — who invented the electronic musical instrument that takes his name: the theremin*. After living in the US for many years, he was repatriated to Russia and imprisoned in a gulag, where he worked in a secret laboratory inventing devices for Soviet espionage. A book featuring a scientist as the lead character may sound like a strange concept, but it works extraordinarily well, probably because Michaels gives Dr Theremin such a compelling voice — part arrogant, part naive, often bewildered and constantly lovelorn — and adds a few fictionalised elements to his character — he practices kung fu, for instance — which gives the story an almost surreal quality. I’m going to be completely up front and stake my colours to the mast, or the flag to the pole, or whatever that saying is and confess that this is my favourite novel on this year’s Giller Prize shortlist. It’s the kind of book that takes you on an adventure and is told in such a refreshingly intimate way that I felt slightly bereft when I finished the book (about a month ago) because I did not want the journey to end. And ever since, I’ve been thinking about Lev/Leon and marvelling at his extraordinary life. The book opens with Leon onboard a ship “plunging from New York back to Russia” . But the door to my cabin is locked. I do not have the key. Just a typewriter, just paper and ink, just this story to set down in solitude, as the distance widens between us. This story is essentially a love letter to a young American musician called Clara —”the finest theremin player the world will ever know” — who has spurned Leon’s advances and married someone else. His tale is divided into two main sections: his life in the US, where he pursues the idea of mass producing the theremin so that every home has one; and his life back in Russia, sent to a gulag for the rest of his life for a reason that is never quite made clear. But the one constant in his life is his unrequited love for Clara, which thrums like a theremin throughout. Admittedly, the first section, set in glitzy Manhattan during Prohibition, is far more exciting than the second, but each informs the other, because it allows us to experience both Leon’s (almost spectacular) success followed by his dramatic fall from grace. Once courted by the rich and famous, showcasing his invention in Carnegie Hall and performing with the New York Philharmonic orchestra, and hanging out with the likes of Einstein, his life takes an unexpected twist when: (1) he finds out he hasn’t paid his taxes in six years and is going to become bankrupt; and (2) he’s coerced into becoming a Soviet spy, informing on people and institutions he appears to know little about. What makes this story so interesting is something I mentioned earlier: Leon’s voice. It’s not that his voice is unreliable, but when he becomes a spy it’s hard to determine to what extent this is deliberate or accidental — we can never be 100 per cent certain that he is telling us everything he knows. Is he being economical with the truth, is he merely naive or has he become caught up in events his scientifically minded brain can’t comprehend? At times he seems alarmingly trusting — for instance, he leaves all his business decisions to a man he knows little about and then seems unfazed when he’s barely got a dime to rub together. But just when you have Leon pegged as being a passive character, he does something completely left of field (I can’t reveal it here, because it’s a bit of a plot spoiler) and you realise you should never under-estimate him. UPDATE — SUNDAY 9 NOVEMBER 2014 : The Shadow Giller Prize jury has chosen Us Conductors as our winner. You can find out more via the official announcement on KevinfromCanada’s blog. UPDATE — TUESDAY 11 NOVEMBER 2014: The REAL Giller Prize has also chosen Us Conductors as its winner! How wonderful! You can find out more via the official announcement on the Giller Prize website. * You can see a clip of Leon Theremin playing the theremin on YouTube. Brits of a certain age may be more familiar with musician John Otway playing the instrument. I’ve wanted a Theremin for so long! This novel has to go straight on to my wishlist. Good Vibrations is also noted for using a Theremin – the Ooh-eee-ooooh-eeee-ooh bit! This is my favorite from this year’s shortlist as well. I had some quibbles about the language as the dialogue felt awfully familiar for the time period in which the novel is set, but a month later and this is the one book of the four I’ve read off the shortlist that really stands out in my mind. And, like you said, it’s a fun read with a intriguing theme. This one has stayed with me, as has Itani’s “Tell” but I’ve not been overly impressed with the list as a whole. I think the real Giller will go to Toews, the one book I’m yet to review. Have you reviewed Us Conductors? If so, please do leave a link so others can read your thoughts. I’ve actually enjoyed the titles I’ve read off the longlist more than those on the shortlist. Go figure. Most of the speculation I have seen has Toews heavily weighted as the winner, but I have yet to read her novel or Itani’s ‘Tell’ since Toews won’t be published in the States until Nov. 18 and Itani in January. You make this sound fantastic. I hope to read it soon! And the links you provided of the instrument being played were fun! I also loved All My Puny Sorrows, but haven’t read any of the others. I’m afraid I didn’t much like the Toews. I read it in the spring, way before the longlist came out, and took some notes, so really need to get my act together and pen a review tomorrow, before the real Giller winner is named on Monday! This sounds like an intriguing read with a bit of everything. It’s such a great read, Claire, and thrilled that my fellow jurors thought so too. And it’s one of the very few that is available to purchase in the UK. Alright: thanks for finding the perfect book to give my husband for Christmas. This sounds really interesting and different. I like a book that can’t easily be pigeon-holed. Oh it’s a really wonderful read, Annabel. I’m chuffed it won the Giller.